Yesterday I began cleaning out the resource area of my office, making space for new ideas, new energy and new such. Much was dated 1998, 1999, and 2000 and quickly filled the recycle bin – I can find more up-to-date information online if I ever need it, so why hold onto mouldy-smelling papers? It felt good to get rid of that stuff. I have several more bins to fill before I’m done! But, I did find one postcard that I bought back in university at the campus bookstore. Seeing it still makes me laugh. 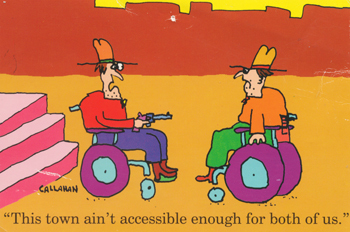 The cartoon is drawn by John Callahan who became a quadriplegic resulting from a car accident. His cartoons reflect life from his own unique perspective. His sense of humour is dark and oftentimes politically incorrect, but hilarious in a way. Explore his website at your own risk! You’re right — it’s incredibly freeing to clean up your own personal space! I travel frequently, so my bedroom floor picks up my detritus from various travels — things I don’t need on the next trip, for example. Since I’m often unpacking/repacking in 36 hour or less, I don’t always take the time to clean this up – with the resulting BIG pile in a few weeks’ time. So now, every time I walk by the pile, I pick up 4-5 things and put them away properly. Voila! My pile goes down by leaps and bounds, and I get motivated to do a bit more. 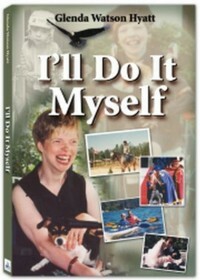 So you go, girl! Purge away! Cool and cruel cartoon. This cleaning out project of yours is turning up some fun stuff.